The Baltic Amber (Succinum) is an old yet not often prescribed homeopathic remedy. Many years ago I have seen an amazing improvement in a child with asthma when parents gave her an amber necklace to wear. During a journey to Eastern Europe in last summer, I was reminded of this again and I decided to give the amber more attention, to find out more about its energy. Baltic Amber is 44 million years old. It is a fossilized tree resin which had been produced in forests of conifers in the Eocene period. There is no clarity about the exact species of conifers, but the latest research suggests that they belonged to the family Sciadopityaceae. Since Neolithic times amber has been used as gemstone because of its beauty. Four homeopaths met for a Shameeah / C4-Trituration. It was a blind trituration, so the participants did not know which substance they were triturating. In the first evening, after C3 was completed, the identity of the substance was revealed. In the first hour of a C4-trituration, the C1-level is reached in which we experience mainly physical symptoms. In the second hour, in C2, generally emotional problems appear. In C3, being the mental level, we start to understand the problem that the substance we are triturating challenges us with. In C4 we are allowed to touch the essence, the core of the remedy which is often a deeply spiritual experience. Here the problems that we had experienced in the lower levels usually turn into a blessing, into a gift. This is a very short and simplified explanation of the intriguing energetic process of a C4-Trituration. Shameeah is my personal style of a C4-Trituration, very much influenced by my Native teachers. It is a sacred ceremony of communication with nature. In the C1-level of the amber Shameeah we had massive physical symptoms very similar to allergies. We suffered from itching all over our bodies. We were coughing and sneezing and one participant had the feeling that her throat was swelling internally, that it was closing. One person’s nose was running. Pain in the eyes had a stinging character “like needles”, pain in one’s shoulder was felt as “stabbing like with a nail.” One participant had a lot of bloating and loose stools, which are unusual for him. We felt warm and had red cheeks. Children were mentioned often. One person had a vision of a baby in a crib, someone else saw children playing, one woman felt as if pregnant, another one as if she would be breastfeeding. One was “rubbing a baby’s belly”, someone else wiping a baby’s bum or again somebody else saw a child in a mother’s lap. “I am grinding grain to nurture the children.” – “I talk to a crying baby and console it: I know it is harsh here and you cannot leave.” This reminds us on a fly trapped in an amber. Resins preserve. Trees cover up injuries with resins and heal wounds. Time played a major role. It felt different. “I could go on forever.” – “This is a golden moment.” There was a sense of timelessness. Or that we are dealing with a solidified, preserved moment as if someone would have stopped the constant flow of time altogether. Before we went into the second hour of triturating, the lactose was diluted in order to make the energy of the amber vibrate higher so it reaches a finer, higher level of vibration in us. This level is called the C2-level and here we usually resonate with our emotional body. The home space felt like being safely held in a loving family. Strangely, however, everyone felt alone in this space, as if nobody was there besides oneself. “I am in a very comfortable and safe home. I am the only one here and I want to get out. I walk to the door and go back, I go there again, I open the door, get scared and close it again. I am very irritated, I want to get out there but something is holding me back, I just cannot leave.” This participant felt like the fly enclosed in a piece of amber. It is beautiful and safe, yet there is no one else present and in the end, it is still a prison. The complete opposite of the locked in situation came up in the image of buffaloes on the prairies. The prison was turned into the freedom of the wide open prairies, the sensation of being alone into a herd of buffalo which represents definitely being held safe in community. After another step of diluting and raising the vibration of the “remedy”, we went into C3-level. In C3 we usually can see the bigger picture and understand what we had been going through so far. Images of wide open landscapes in winter came up: “I see an arctic landscape, everything is covered with snow.” – “I feel the icy cold wind blowing over the prairies in winter.” These expressions symbolize partially the C3-level in general, as the mental realm which we enter in C3 has winter qualities of clarity, sharp contours and the almost unlimited freedom which we have in our mind, in our thinking. At the same time these images also result in the inner movement towards the opposite which we know very well from plant remedies, the opposite here being the freedom of the wide open spaces as opposed to the feeling of being locked in. It is time for a youngster to leave home. She / he is going back and forth between leaving, getting scared and looking for the sheltered home again. The step to leave has to be done alone, there is no group of friends to sweep her up and take her on the journey. Someone makes the jump into his / her own life with aggression towards the family and disconnects from the family after leaving. In the energy of the amber this also is an expression of the fear of leaving. A child is held back either by criticism, reproaches or over-protection and has a hard time to leave the safety of the close family in order to connect to the bigger world, in order to make friends. A newborn, a baby or even a fetus during pregnancy might be exposed to painful influences and separation in an untimely manner, when it still needs the total comfort and safety of the mother or the womb. Amber is definitely a remedy suited for children, especially sensitive children who are easily discouraged by blame and reproaches. After C3 the identity of the remedy was disclosed to the participants. After C3 we are deep enough in our process that information provided about the remedy will not deviate our experiences. At this time knowing the remedy actually enriches the process. For the final completion in C4 all information is welcome and useful. In the morning of the second day of our ceremony we started with sharing our dreams. “There were two creatures, a mother and a child. I was playing with the little one but it became irritable, it seemed kinda alien-like, it wanted its mom. Emma, the mom had little balls of sap, it must have been the resin, she said that the resin was for the baby creature.” Themes of our trituration can easily be recognized: A baby creature separated from its mom becoming afraid and irritable. In that moment the resin / amber was ready for the baby. We had a fairly clear picture about the problem and the situation Succinum would be appropriate for, and about the people who would benefit from this remedy. With that we were ready to go into C4. In C4 we touch the essence, the sacred core of a remedy. This is not part of the “remedy picture” on which homeopaths prescribe. In C4 the remedy tells us about its deeper purpose, about the gift that it represents. Typically C4 has a sacred feel to it which is hard to describe in words. It needs to be experienced. In the amber we stop time, we sink into this timeless moment which is the only moment that ever existed and the only moment that ever will exist. Like a mountaintop reaching above the clouds, in the same way the amber reaches above the clouded reality in which we live, reminding us, consoling us. In the awareness of this birthing reality our fears transform into presence. Not into courage, that would be only the other side of fear. Fears are being transformed into sheer presence. In this presence we embrace both fear and courage knowing that they are two sides of the same game, two faces of the same child. It is the children’s game of wearing masks. If I try to formulate an essence of the remedy, it would be on the level of pathology that we see in the homeopathic remedy picture: As the ancient conifers secreted the resin in order to seal an injury, Amber seems to lend itself when after an early trauma a child retreats into an inner world in which it is alone and safe. His evolution is arrested here, she/he is being held back in this safe place too long or losing the safety too early. The gift that the amber offers in its sacred core is the potential to discover the sacred space of timelessness which gave birth to time in the first place and which always holds us in safety. 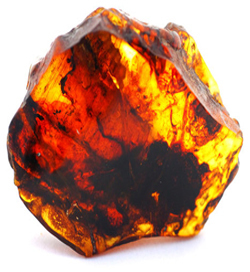 It could be expected that a patient treated with Amber will be able to leave this prison, to establish relationships again and to continue the interrupted evolution, at the same time retaining the precious ability to retreat into an inner sacred space of safety when necessary.